This week, Clarke Mosquito Control's Beechcraft planes will begin flying over the city of Dallas and surrounding areas spraying mosquitoes in an effort to reduce West Nile Virus. It will be the first time in 40 years that Dallas has had aerial spraying. The chemical? It's called Duet and it's an EPA-approved synthetic pyrethoid that isn't much different from the chemicals people use to kill mosquitoes on the ground. Duet works by "exciting" the mosquitoes and drawing them out of hiding places and into the spray. Supporters of aerial spraying include State Health Commissioner David Lakey who said the chemicals were safe. Dallas Mayor Mike Rawlings also tried to assure residents that the dosage would be lower than the amount used for ground spraying and that it has been used in other states including California, New York and Massachusetts. But others are concerned about the chemicals, including members of the Dallas City Council, who questioned how it would affect the health of people and their pets. The product, for example, states that it's "toxic to aquatic organisms including fish" and that it can kill honey bees and can be dangerous if mixed in drinking water. The mosquito company has also urged people to stay indoors, stay away from windows and bring their pets in during the spraying. One group filed an injunction to stop the spraying. But the injunction is unlikely to pass because Texas had declared a state of emergency. 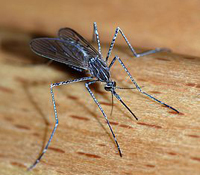 So far, there have been more than 389 cases of West Nile Virus and more than 16 deaths. "There is a public health emergency related to West Nile right now," Lakey said. "The risk of air-based spraying is minimal versus the ongoing spread of West Nile." Do you agree with Lakey? Is it worth it? I guess we will find out once we know how well the spraying worked. One thing no one seems to know is how many mosquitoes the spraying will kill. Does this mean we will have no mosquitoes left in Dallas after the spraying? Even if we just have a few mosquitoes left with West Nile, the virus could begin spreading again.